Please click here for information about claiming free school meals, clothing grants and free transport to school; this is now done online. Alternatively, contact details are available from the school office. Around half of our pupils come to school each day on minibuses provided by the Local Authority. Meals are cooked on site each day. 70% of pupils eat school dinners; our cook provides a changing menu of healthy balanced meals using fresh produce, and including vegetarian or gluten free options when necessary. Payment can be made weekly (please ask for a named plastic wallet) or half termly in advance if you prefer; bills are sent out to parents at the start of each half term. Parents are asked to give 3 weeks' notice if they intend to change between dinners and packed lunches. Please click the Dinner menu link to see the menus. We also run the school milk scheme. Milk is free for Reception children until the week of their fifth birthday, and is then subsidised to make the cost to parents very reasonable. Children throughout the school can take advantage of this scheme. Free fruit is provided for children in Reception, Year 1 and Year 2; this is funded by the Government. Older children can bring in a healthy snack from home. Chilled drinking water is available in both classrooms, and bottles are sent home each week for washing. It is much easier and fairer to all the children if they are all sticking to the same guidelines. We hope you will agree that this is an important matter for the health of all our children, and feel able to help us with this. Please click here to access the latest dinner menu. 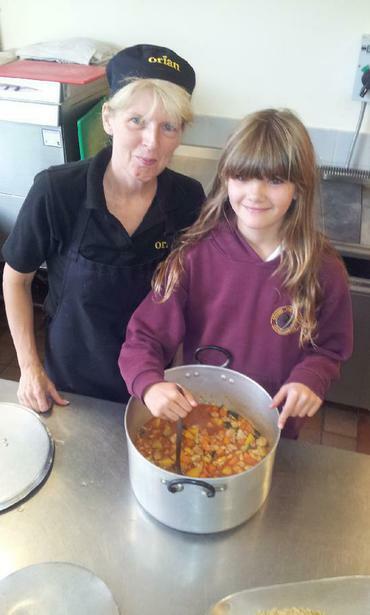 The Governors instigated a school meal survey, details of which can be viewed here, this resulted in new menu, proposed by the children and expertly interpretted by our great cook Freda. Please click above to access the latest dinner menus, which will be cooked in the Spring term 2016.